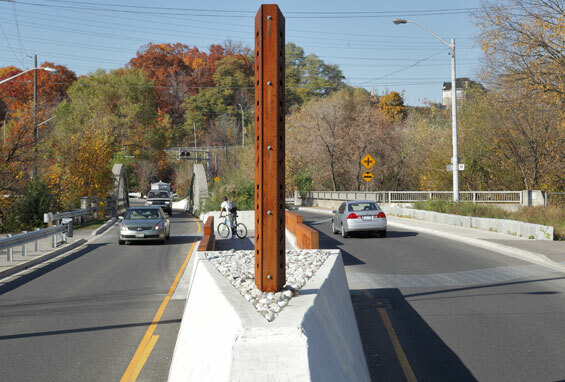 The Pottery Road Bicycle and Pedestrian Crossing is the first component in a larger scheme to provide interpretation, accessibility, and environmental control for Crothers’ Wood — one of the few remaining fragments of Carolinian forest in Toronto and throughout Canada. The site has been designated an Environmentally Sensitive Area (ESA) by the Toronto and Region Conservation Authority, and is part of the City of Toronto’s Terrestrial Natural Heritage System along the East Don River Valley. Pressured by its urban location, the site’s heavy usage by hikers, cyclists, and dog walkers had led to numerous unplanned and unsustainable trails, as well as a dangerous crossing at Pottery Road. 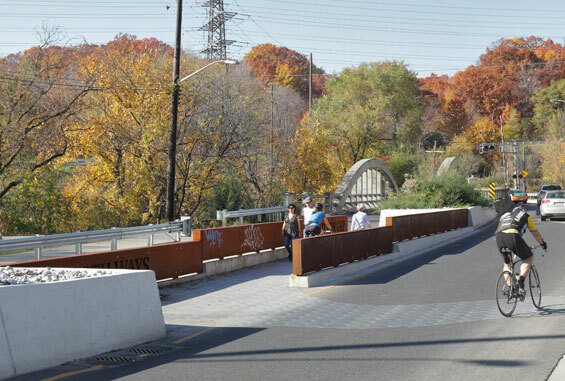 Our project was designed to improve safety and create a landmark entry to the Lower Don Recreational Trail in Toronto. 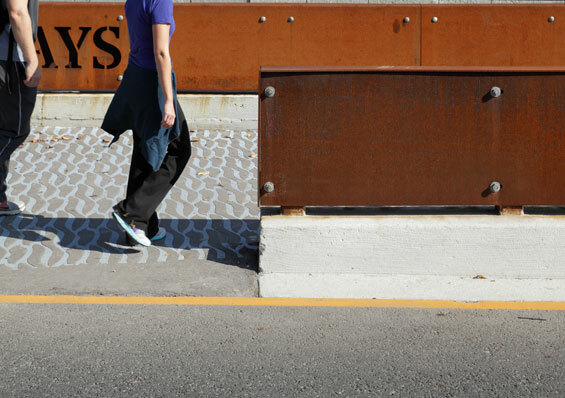 As a streetscape and gateway, the controlled crossing draws on key elements of the Don River, with select materials echoing the site’s ecological and post-industrial location. 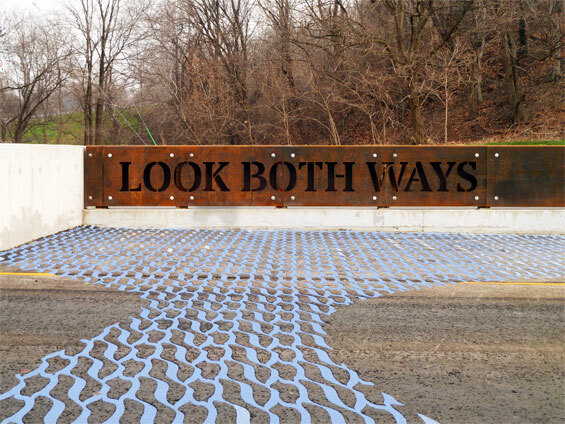 These include water graphics and laser-cut signage that direct and control both pedestrian and cyclist traffic. 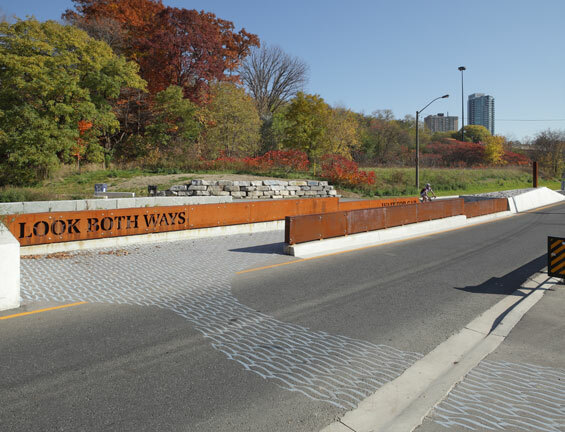 This award-winning urban design project comprises a road-island with safety and street signage, pathways that link converging bicycle trails, and seating/safety thresholds that slow traffic. 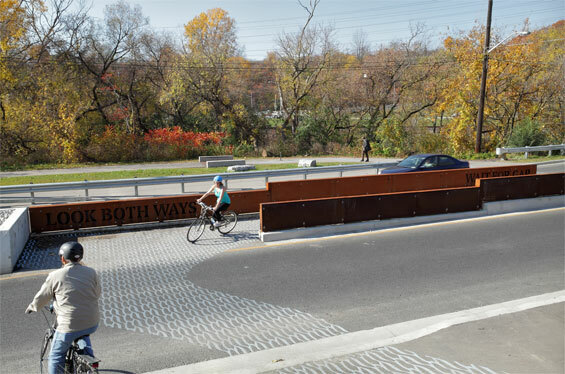 Calibrated to anticipate the speed and sight-lines of passers-by, the project’s custom fabrication, typography, and visual graphics announce the river and road crossing to cyclists, drivers, and pedestrians. 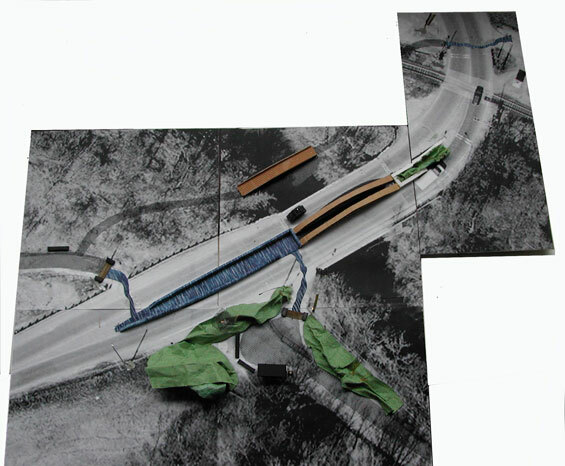 The larger scheme will include a network of orientation kiosks, benches, pathways, distance markers, and interpretive markers that register historic flood lines, Together, these elements create a more formalized experience of the site while protecting its fragile conditions for future construction.